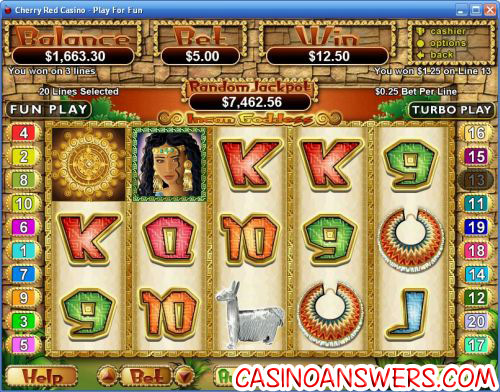 Incan Goddess Video Slot Guide & Review - Casino Answers! Incan Goddess is a 5-reel, 20-line video slot developed by Realtime Gaming, featuring a wild substitute symbol, scatter wins, multipliers, a free spins feature, a gamble feature and a progressive jackpot. You can play the Incan Goddess Real-Series Video Slot casino game at US-friendly online casinos Slots Oasis Casino and Lucky Red Casino. Use the arrows next to “Bet” to select your bet of $0.01, $0.02, $0.03, $0.04, $0.05, $0.06, $0.07, $0.08, $0.09, $0.10, $0.25, $0.50, $1, $2.50 and $5 per line. You can then use the arrows next to “Lines” to set your number of selected paylines from 1-20. The lowest bet you can make on Incan Goddess is $0.01, making it a penny slot. You can make a total bet of up to $100 per spin. For those who wish to manually stop the reels mid-spin, you can hit the “Stop” button to bring the reels to a complete halt and be paid for any winning combinations you receive. To play the Incan Goddess slot machine, press the “Spin” button. The highest paying symbol on the Incan Goddess online slot game is the Incan Goddess symbol. It will pay out the 5000 coin top jackpot for 5 symbols on a selected payline. The Goddess symbol is wild and will substitute for all symbols on the Incan Goddess slot machine except for the Temple scatter symbol. There are other high payouts on the Incan Goddess slot machine, including 2500 coins for the Incan Sun and 1000 coins for the Pottery symbol. The Temple symbol is the scatter symbol on the Incan Goddess video slot. It will pay out 2X, 3X, 10X or 100X for 2, 3, 4 or 5 scatter symbols respectively. Scatter wins are multiplied by total bet. When three or more Scattered Temple symbols appear on the reels, you will win 12 free spins with a 2X multiplier. All of your winnings will be doubled during the free spins feature. Winnings will be doubled a second time if the Goddess symbol appears in the winning combination. The free spins feature can be re-triggered. The Double or Something feature can be triggered during the free games feature. Free games are played at the paylines and bet of the triggering game. The Incan Goddess video slot is home to a progressive jackpot. The progressive jackpot is at the time of this writing at $7,500 and hopefully even higher whenever you happen to be reading this Incan Goddess slot review. The progressive jackpot is randomly won, so you do not need a winning combination to take it home. However, if you want a tip on how to better your chances of winning it, it won’t hurt to increase your bet per line. To give it your best shot and try for this and many other progressive jackpots, head over to Slots Oasis Casino! Hit the “Autoplay” button to open the autoplay settings on the Incan Goddess slot game. You will be able to set the number of spins, set it to stop when the jackpot is won, stop if a win exceeds or equals (any amount you input), stop on any win, stop if your balance increases/decreases by any amount you input and stop once the feature is triggered. You can stop Incan Goddess’ autoplay mode using the “Stop Auto” button. To speed up the gameplay, simply hit the “Turbo Play” button in the autoplay mode. All symbols pay left to right only, except for the Scattered Temple (which pays any). Wins on different paylines are added. Scatter wins are added to payline wins. Scatter wins are multiplied by the total bet. Payline wins are multiplied by the bet per line. Highest win only on each payline. Maximum win per paid spin is 50,000X bet per line. Incan Goddess not only has several good payouts, a progressive jackpot and a free spins feature, it also gives you the opportunity to double what would already be a big 5 of a Kind win. The graphics look great and the sound effects hold their own as well. To try the Incan Goddess video slot now, sign up and make your first deposit at Slots Oasis Casino! Are players who are based in the United States of America able to play Incan Goddess for real money? Players based in the USA are welcome to play the Incan Goddess casino game for real money at their choice of Slots Oasis Casino and Lucky Red Casino. For a list of other RTG online casinos where you can find the Incan Goddess video slot, please read our list of Realtime Gaming casinos. If you’re from outside the USA, you can play Incan Goddess at King Solomons Casino. Can I find a free Flash game of the Incan Goddess online slot? Unfortunately, Slots Oasis Flash Casino and Lucky Red Flash Casino do not offer the Incan Goddess video slot as apart of their Instant Play casinos. On the bright side, you will be able to play a Flash version of the Aztec’s Treasure video slot. How do I win the Incan Goddess progressive jackpot? Due to the fact that the Incan Goddess progressive jackpot is won at random, all you have to do is hope you have a lot of good luck while spinning the reels. No winning combination is required to win the Incan Goddess progressive jackpot. How do I trigger the Double or Something feature on the Incan Goddess slot? 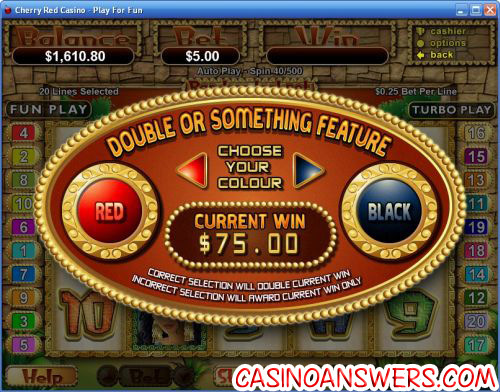 To trigger the Double or Something gamble feature, you must hit five of any symbol on a selected payline. This includes the Scattered Temple symbol. Where can I play the Incan Goddes Video Slot?